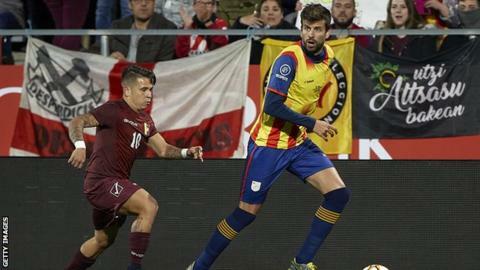 It is Pique's 10th cap for the region and his first since he retired from playing for Spain following the 2018 World Cup. Venezuela, who beat Lionel Messi's Argentina last week, equalised through Roberto Rosales but Espanyol's Javi Puado scored the winner for the home side in the 87th minute. Brighton full-back Martin Montoya and Southampton midfielder Oriol Romeu, as well as Real Betis' Marc Bartra, also featured for Catalonia.